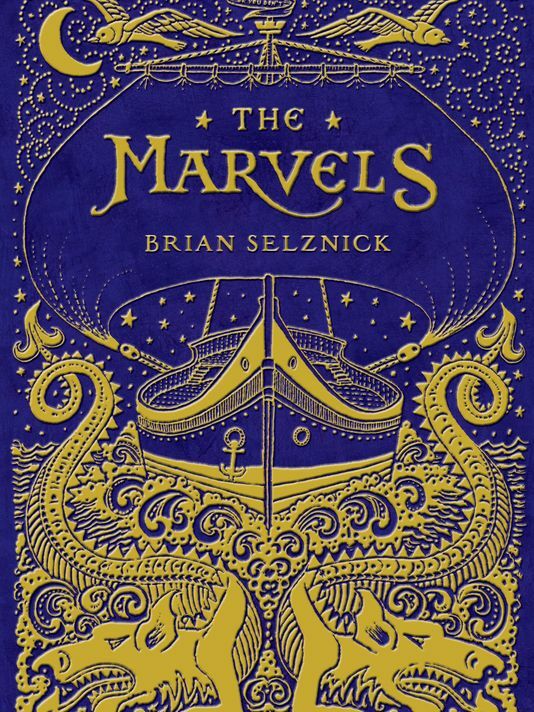 Books like The Marvels by Brian Selznick are why I read and books like The Marvels what keep me reading, in the hopes of recreating the magical experience of being completely immersed in another world, another time. If you have read The Invention of Hugo Cabret then you know the special gift and pleasure you are in for when you hold this gorgeous 672 page tome in your hands and prepare to begin turning pages, which you may do quickly at first. 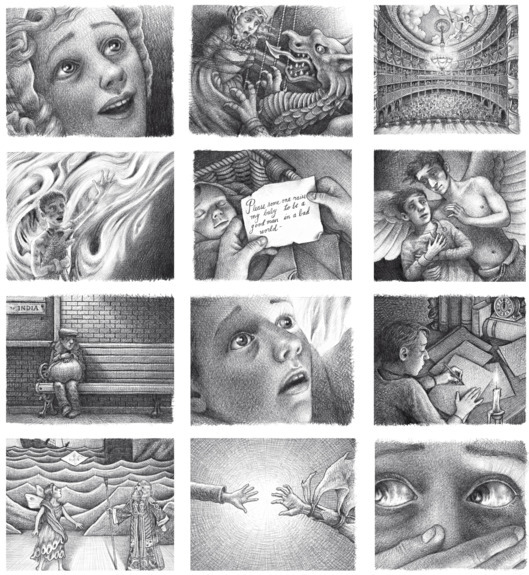 The first half of the book, almost 400 pages, is comprised of illustrations, all two page spreads. I found myself lulled into a mesmeric rhythm as I scanned an illustration with my eyes then slid my hand across it to turn the page, taking in the images, piecing together the images and making sense of the story that was unfolding before me. 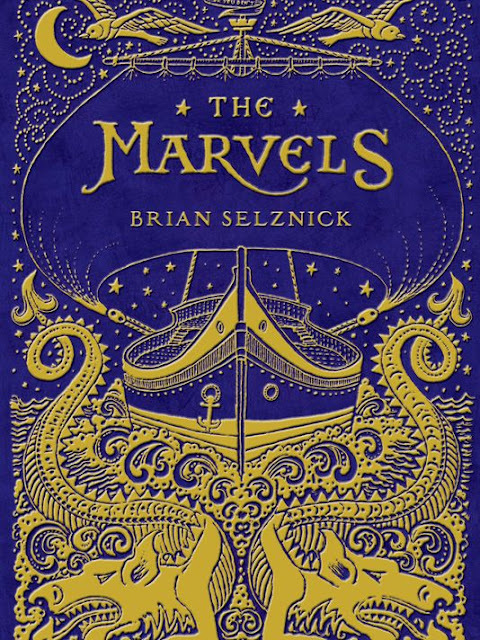 The book trailer, made by Selznick, gives you a good taste of what you are in for when you open the covers of The Marvels. Be sure to read to the end of this review where there is another clip showing the making of the trailer. Selznick truly is a Renaissance man. Set in 1766, the illustrations tell the story of a young stowaway, Billy, his dog Tar and his beloved older brother Marcus, at sea on an American whaling ship named the Kraken. They are performing a play for the crew when a storm strikes. Marcus does not survive, but Billy (and Tar) makes his way to London and finds himself taken in by the a construction crew, made up mostly of sailors, who are building a theater. After telling his story to the artist in residence, an image of Marcus, angel's wings on his back, is painted on the ceiling of the theater. The Royal Theater becomes Billy's home and Billy, who takes the last name Marvel, becomes a father when an infant is left at the backdoor of the theater. This redheaded boy, named after Billy's brother, goes on to marry and, with his wife, become theater royalty. Their son, becomes even more famous, in part for his wild, impetuous personality on and off stage. In turn, Alexander's son Oberon, named after Alexander's greatest role, marries and has a son he names Leontes, after his greatest part, playing King Lenotes in A Winter's Tale. Leontes, however, has no taste for the theater and is a disappointment to his parents. As the 1766 portion of The Marvels draws to a close, Leo discovers his grandfather living secretly in the bowels of the theater and also finds the courage to follow his heart and head out to sea. As he waits at the dock to set sail, he sees flames and smoke. The Royal is on fire. Leo rushes in to save his grandfather. Then the page goes blank. After this visual pause, we learn that it is now 1990. Joseph Jervis has run away from the boarding school rather than spend the holidays alone there while his parents are on a cruise. He is also mourning the absence of his best friend and fellow avid reader, Blink, who ran away from school weeks before. Joseph heads to London to find and uncle he has never met in the hopes that he might also find a home. What he finds, while peering in at a window late one snowy night, is a magnificent mansion where a party seems to have just ended. The room is lit only by a blazing fire and the gentle glow of candles. There is food on the plates and napkins thrown aside. There is a painting on the wall of an old whaling ship with the name Kraken painted on its prow. With Joseph and his uncle, Albert Nightingale, Selznick works more magic, this time with the words of his story rather than the power of his illustrations. There are secrets, surprises and heartbreak woven into the story of Joseph and Albert and loved ones lost. Ransom Riggs, author of the trilogy of books known as Miss Peregrine's Peculiar Children, YA novels that use vintage found photographs to help tell the story, has written a review of The Marvels for the New York Times. Ending his review, Riggs notes that, "Fiction isn't false, but a container of encrypted truths: autobiographical one, sometimes, and in very good stories, emotional and universal ones too - the sort of truth facts aren't much good at reaching. Fiction is often better at telling the truth than facts, and that's the marvel of it. You either see it or you don't." The final sentence of Rigg's excellent review repeats an important line from The Marvels that Joseph first notices, in Latin, engraved on the lid of a silver matchbox, is, according to Albert, the house motto. "You either see it or your don't," speaks to so many layers of the second part of The Marvels, from the inexplicably antiquated state of Albert's house, the absent family who has always just left it and Albert's lost beloved. What I, as an adult, could see as I read The Marvels, and what Joseph comes to see as Albert finally shares the details of his life and the creation of the house with him, is the underlying tragedy of AIDS. For me, the motto, "You either see it or you don't," also reminds me of the way that so much of society for so many decades chose not to see, not to recognize the possibility of, love and commitment between two men or two women. Seen but not seen, not seeing seemed to be a choice on the part of so many of us, the way Joseph's mother Sylvia, chose not to see her brother Albert. I'm not sure what young readers will gather from the story, but I am sure that the stories told in The Marvels will stay with young readers well into adulthood, resonating and taking on deeper meaning. And, deeper meaning is a powerful part of The Marvels. I chose to read The Marvels with a clean slate - I avoided all reviews and other information about the book because I wanted to dive into it completely. I'm happy I did, because, after finishing the final, illustrated pages of the story, the afterword sucked me in again. As with the French filmmaker George Méliès, a major character in The Invention of Hugo Cabret, The Marvels is also inspired and influenced by a real person, his contributions to art, history and society and the people who helped support this endeavor. Albert Nightingale is the fictional version of Dennis Severs, an American (who, knock my socks off, grew up in Escondido, CA, the same hot, dusty little town I have lived in for 23 years!) with a passion for Victorian England. Arriving in the late 1960s, Severs began giving horse and buggy tours of the city that became popular enough to allow him purchase 18 Folgate Street in Spitalfields, London in 1979. Selznick uses this address for Albert's house, as well as many details of the real Dennis Severs House, the most visited museum in London. Severs created a fictional family, the Jervises, who had been living in the house for centuries. In his obituary of Dennis Severs for the Guardian, Gavin Stamp calls Severs, who died in 2000 after long being HIV positive, the "Curator of a three-dimensional historical novel, written in brick and candlelight in Spitalfields." Knowing this about The Marvels, having it framed in this way after living in the story as I read it, makes it all the more meaningful and significant to me.